An ankle joint pushing system that absorbs the horizontal movement of the talus is proposed, and the effects of the horizontal movement absorbing mechanism in the system are examined. The bending of the ankle joint is an important medical treatment that physical therapists (PTs) utilize to help their patients recover their ability to walk and to prevent contracture. However, since the ankle treatment requires a large amount of force (nearly equal to the subject’s weight) plus precise angle and power control, manual treatment by PTs has not been replaced by mechanical treatment systems. In order to realize the mechanization of the ankle joint pushing treatment, the system developed here uses two features. (1) The proposed device fixes the ankle joint position correctly by making contact with the Achilles tendon, the back of the calf, and the hip. (2) The bucket rotation center shifts its position horizontally with the movement of the talus when the foot is pushed back. This mechanism can push the toes or any part of the foot strongly and stably without causing the patient any pain. It can also stretch the biceps femoris and gastrocnemius muscles simultaneously, which could previously only be done by a physical therapist. During 73 N stretching treatment tests done on four subjects, 22.2 mm (S.D. 6.4 mm) horizontal (ventral direction) movements of the ankle joint were observed due to the movement of the talus, and our proposed device mechanism successfully suppressed the movement to a 1.8 mm (S.D. 1.3 mm) horizontal (ventral) movement in the same 73 N stretching treatment. H. Toda, T. Matsumoto, and H. Takeuchi, “Experimental Study of Ankle Joint Pushing Mechanism Concerning About the Horizontal Movement of Talus,” J. Robot. Mechatron., Vol.29, No.2, pp. 299-305, 2017. K. Fukui and S. Maeda, “Rehabilitation of old man,” Japanese books, Igaku-syoin, 2010 (in Japanese). A. Kato and S. Hirano, “Development of rehabilitation equipment of the foot joint, which aims to walking recovery,” Joint symposium proceedings, pp. 220-223, 2003 (in Japanese). D. Matuura, T. Koga, and G. Takeda, “Development mechanism of ankle rehabilitation device having a joint load reduction function,” 30th Anniversary Annual Conf. of the Robotics Society of Japan meeting, Sapporo, 2012 (in Japanese). S. Suzuki and A. Matumoto, “Rehabilitation of knee, ankle joint with pneumatic actuator,” IIP information, Intelligence and Precision Equipment Division Conf. Proc., pp. 355-358, 2005 (in Japanese). Y. Tsukamoto, K. Wada, F. Fujii, and T. Tamura, “Performance of the ankle joint stretching apparatus,” The JSME Symposium on Welfare Engineering, pp. 141-144, 2008 (in Japanese). R. Tanizaki, H. Toda, and G. Capi, “Development of ankle contracture removal equipment that reproduces the continuous passive motion method physiotherapists,” 30th Anniversary Annual Conf. of the Robotics Society of Japan meeting, Sapporo, 2012 (in Japanese). H. Toda, R. Tanizaki, and T. Imaeda, “Ankle contracture removal system,” Japanese patent JP2014-14493, 2014. H. Toda and R. Tanizaki, “Advanced ankle contracture removal system,” Japanese patent JP2015-226609, 2015. T. Matsumoto and H. Toda, “A Proposed Mechanism for Ankle Joint Rehabilitation Using a Brace Structure,” Int. Conf. on Ubiquitous Healthcare (u-Healthcare 2015), Osaka, pp. 136-137, 2015. H. Toda, T. Matsumoto, R. Tanizaki, and T. Imaeda, “Ankle joint pushing mechanism by stabilization of ankle position using a brace structure,” J. of Advanced Mechanical Design Systems and Manufacturing, Vol.10, No.1, pp. 1-11, 2016. P. J. Mansfield and D. A. Neumann, “Essentials of Kinesiology for the Physical Therapist Assistant 2nd Edition,” St. Louis, MO: Mosby Elsevier, 2013. S. Kakurai, “Rehabilitation system,” The Japanese J. of Rehabilitation Medicine, Vol.31, No.3, pp. 205-212, Mar. 1994. K. E. Hagbarth, J. V. Hagglund, M. Nordin, and E. U. Wallin, “Thixotropic Behaviour of human finger flexor muscle with accompanying changes in spindle and reflex responses to stretch,” The J. of Physiology, pp. 323-342, Nov. 1985. K. Nagasawa and S. Shiraishi, “Muscle oxygen saturation of the expansion site and the effect on the muscle blood flow from the difference of extension time of static stretching,” Physical Education Research, Vol.56, No.2, pp. 423-433, 2011 (in Japanese). H. Watanabe, J. Matuoka, S. Nashimoto, R. Koga, G. Oomori, K. Endo, M. Tanaka, A. Nawada, and R. Sasaki, “Study of the quadriceps muscle tension level change caused by lower limb muscle strength-training equipment for the valid duration of static stretching,” Koseiren Medical J., Vol. 22, pp. 34-38, 2013 (in Japanese). Y. Hayashibara, H. Hakogi, and K. Watanabe, “Development of rehabilitation for CPM device using a variable stiffness mechanism,” Robotics and Mechatronics Conf. abstracts, p. 75, 2003 (in Japanese). A. Mero, P. V. Komi, and R. J. Gregor, “Biomechanics of sprint running, A Review,” Sports Medicine, Vol.13, No.6, pp. 376-392, 1992. S. Nagase, N. Saga, and S. Suga, “Development of ankle prevention instrument using pneumatic artificial muscles,” Life support medical welfare Engineering Society Joint Conf., 2D1-4, pp. 289-291, 2010 (in Japanese). Y. Noda, S. Sasaki, S. Iwasa, T. Ooura, H. Tate, and M. Takahashi, “Development of a simple device for the ankle dorsiflexion limitation of movement prevention,” Hokkaido Social Insurance Hospital Bulletin, Vol.6, pp. 15-18, 2006 (in Japanese). M. Hirasawa, H. Okada, and M. Shimojo, “The Development of the Plantar Pressure Sensor Shoes for Gait Analysis,” J. of Robotics and Mechatronics, Vol.20, No.2, pp. 289-295, 2008. S. Yasuno, T. Kamamo, S. Suzuki, and H. Harada, “Fundamental study and trial of the ankle joint power assist system,” IEICE technical report, MBE, Bio cybernetics and ME, Vol.103, No.184, 35-3, 2003 (in Japanese). N. Saga, N. Saito, and J. Nagase, “Ankle Rehabilitation Device to Prevent Contracture Using a Pneumatic Balloon Actuator,” Int. J. of Automation Technology, Vol.5, No.4, pp. 538-543, 2011. D. Matsuura, T. Koga, S. Ishida, and Y. Takeda, “Kinetostatic Design of Ankle Rehabilitation Mechanism Capable of Adapting to Changes in Joint Axis,” J. of Robotics and Mechatronics, Vol.25, No.6, pp. 1029-1037, 2013. 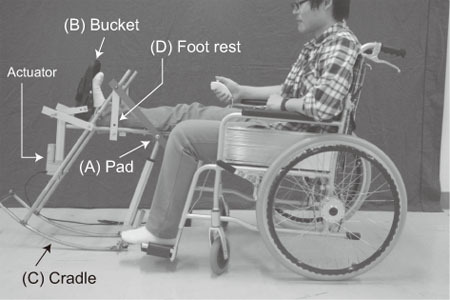 T. Onodera, E. Suzuki, M. Ding, H. Takemura, and H. Mizoguchi, “Force, Stiffness and Viscous Damping Control of a Stewart-Platform-Type Ankle-Foot Rehabilitation Assist Device with Pneumatic Actuator,” J. of Robotics and Mechatronics, Vol.25, No.6, pp. 897-905, 2013. K. Nomura, T. Yonezawa, H. Takemura, and H. Mizoguchi, “Development of Six-DOF Human Ankle Motion Control Device Using Stewart Platform Structure for Fall Prevention,” J. of Robotics and Mechatronics, Vol.28, No.5, pp. 654-663, 2016. G. Lu, A. Zhang, J. Zhou, S. Cui, and L. Zhao, “The Statics Analysis and Verification of 3-DOF Parallel Mechanism Based on Two Methods,” Int. J. of Automation Technology, Vol.7, No.2, pp. 237-244, 2013. E. Tanaka, T. Ikehara, H. Yusa, Y. Sato, T. Sakurai, S. Saegusa, K. Ito, and L. Yuge, “Walking-Assistance Apparatus as a Next-Generation Vehicle and Movable Neuro-Rehabilitation Training Appliance,” J. of Robotics and Mechatronics, Vol.24, No.5, pp. 851-865, 2012. K. Hamada and M. Sasaki, “Effects of Static Stretching on Jumping Ability:from Physiological and Functional Aspects,” Japanese J. of Physical Therapy Science, Vol.23, No.3, pp. 463-467, 2008 (in Japanese).